At Kentucky Dermatology and Cosmetic Specialists, we perform ear-piercing for all age ranges, from infants to adults, with Blomdahl ear piercing. 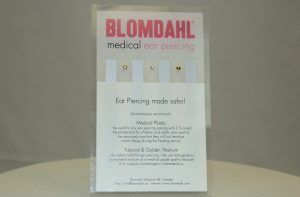 Blomdahl ear piercing is recommended for children and adults, can only be performed by a trained physician and is done with special earrings designed per dermatologists’ recommendations. Avoid the frightening thought of bringing your child to a kiosk in the mall to get their ears pierced for the first time & take the safer route with Kentucky Dermatology and Cosmetic Specialists’ trained skincare professionals. Blomdahl earrings are hypoallergenic – the world’s only ear-piercing earring with 0% metal – and are specially designed to promote a safe and quick healing process. Call Us Today and Schedule Your Complimentary Consultation: 859-276-2556. All Cosmetic Services Are Available in Lexington, KY. Some Cosmetic Services Are Available in London, KY.